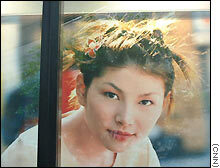 HONG KONG, China (CNN) -- "Flawlessly milky skin is to die for," says a beauty website for Asian women. Get-white messages, like this one on the lighten-up page on asiaMs.net, are inescapable in this part of the world. Pale Asian models peer from the pages of glossy magazines, pout on billboards, ride on white horses in cinema advertisements and jostle for counter space at the local department store. They tout products such as Blanc Expert, White-Plus, WhiteLight, Future White Day, Blanc Purete, Fine Fairness, Active White, White Perfect and Snow UV. Spurred on by modern marketing and a cultural history that cherishes fairness, hordes of women across Asia are slapping on whitening lotions, serums, correctors and essences to bleach their skins. In what may be the biggest toxic cream outbreak ever, 1,262 people flocked to a hotline set up by Hong Kong's health department last week, after warnings that two whitener creams -- Rosedew and La Rose Blanche -- had mercury levels between 9,000 and 65,000 times the recommended dose. Of the 435 callers who were tested for poisoning, one 31-year-old woman was admitted to Hong Kong's Tuen Mun Hospital over the weekend, while 13 others were referred to specialists for further check-ups. Skin whitening has a long history in Asia, stemming back to ancient China and Japan, where the saying "one white covers up three ugliness" was passed through the generations. A white complexion was seen as noble and aristocratic, especially in Southeast Asia, where the sun was always out. Only those rich enough could afford to stay indoors, while peasants baked in the rice fields. In their early bid to lighten up, Chinese ground pearl from seashells into powder and swallowed it to whiten their skin, says Chinese University chemical pathology professor Christopher Lam Wai-kei, while across the Yellow Sea, Geisha girls powdered their faces chalk white. This obsession with whiteness has not faded over time. A survey by Asia Market Intelligence this year revealed that three quarters of Malaysian men thought their partners would be more attractive with lighter complexions. 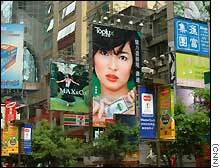 In Hong Kong two thirds of men prefer fairer skin, while half the local women wanted their men paler. Almost half of Asians aged 25 to 34 years used skin whiteners in a business that some analysts have said could be worth billions of dollars. But as companies pump money into new skin technology -- touting heat-sealed capsules and triple-action formulas -- they are being joined by less scrupulous players. In December 2000, Lam and Prince of Wales Hospital doctor Michael Chan tested 36 creams made by cosmetic makers across the world. They found eight creams exceeded the U.S. Food and Drug Administration safety limits for mercury. All eight brands came from China or Taiwan, prompting Lam to predict this could be "the tip of the iceberg" because the creams have been available for several years and widely used. When Lam phoned one Chinese supplier, he was told: "What is wrong with a little mercury in the cream, as long as it can make ladies beautiful." While mercury was considered a strong and effective whitening agent ten to twenty years ago, in high doses it is lethal. It is so toxic and dangerous that when workers used mercury to make felt hats in the 1800s, the psychiatric changes it triggered, led observers to call them as "mad-as-a-hatter." "Mercury is very harmful to the central nervous system and kidney, particularly the developing brain of a foetus and young child " says Lam. Used as a skin bleacher for years, it was only when a smattering of toxic cream cases broke out during the 1990s in Australia, America and Saudi Arabia that mercury was put under the spotlight, sparking calls to boost labeling and purity requirements. "The more effective it is, the less safe it is, and with a strong product the reaction will be expected to be more," says Dr. Wendy Wong Hok-wai, a Hong Kong dermatologist. Rosedew was red-flagged and its shop raided by Hong Kong authorities after it came in at a whooping 27,000 to 60,000 times the acceptable dose. Dubbed the "original Asian beauty secret" its packaging claims to use a "proven Traditional Chinese Imperial Palace secret formula," made from the "100 percent natural ingredients." Set up five years ago, and selling creams made in southeastern Humen from a store in Hong Kong's Central district, Rosedew's owner says that no one knew there was mercury in the creams. "They have always been safe," says owner Don Farthing. "The customs department never had a problem with it in the past." Paris-based La Rose Blanche, whose cream came in at 9,100 to 60,000 times the limit, also stands by its claim that it does not use mercury. The company Web site recently posted a notice on its site saying its beauty creams had passed Hong Kong safety tests. "Our original formulas should not contain any mercury," says John Chan, who overseas the range's distribution in Hong Kong. While piracy is rampant in Asia, and rife in parts of China, it is not yet clear what the status of these products are. No charges have yet been laid against any of the companies but a probe is underway, according to a spokesperson for Hong Kong's customs department. "We won't rule out the possibility that they were fake," said Agnes Law, senior information officer. Lam for one, says laws should be strengthened to crack down on toxic creams and advises customers to check packaging and buy creams from more developed countries. In a bid to allay fears in the marketplace, Hong Kong's consumer council is testing 30 whitening creams for lead and mercury, with the results to be released Wednesday this week, says head of research and surveys, Connie Lau Yin-bing.